If you ask most people what a forklift is they probably will tell you that it is a piece of equipment that warehouses use to move pallets. This, of course, is a correct answer, but it is far from the only thing that forklifts are used for. Today’s forklifts are versatile and useful pieces of equipment used not only in warehouses but also in a variety of other industries and businesses. Advances in forklift technology make them high-tech, material-moving machines that are capable of handling just about any load that you can think of. If you are working towards your forklift operator certification, here are some interesting facts about forklifts that you might not know. The modern forklift as we know it was developed in the 1920s and was called a lift tractor. Similar in design to tractors used on farms, the lift tractor was used to transport materials in factories. The predecessor to the lift tractor was a battery-powered platform truck that became useful during World War I. The lift tractor, and its modern counterpart the forklift, was used heavily during World War II, to make warehouse and factory operations more efficient with fewer people. Yes, that’s right, forklifts and spiders are similar. How can that be, you might ask? Well, spiders use hydraulic pressure to support and move their legs. Without bones, spiders need a different way to move their limbs, so they utilize the same kind of hydraulic pressure that is used to lift the forks on a forklift. Hydraulic pressure is a very efficient way to move an object, just by changing the amount of fluid in a tube. One of the most commonly stolen items from warehouses and construction sites are forklifts. While they are handy tools for moving materials and helping out on construction sites, they are also being used for illegal activities as well. There have been reported instances where stolen forklifts have been used to steal large items, ATMs in particular. Forklifts are used in big places and carry big loads. For instance, the largest building that uses forklifts is the Boeing Everett Factory. This 400,000 sqm facility uses forklifts to transport materials from warehouse to factory. And, we know that forklifts can handle pretty heavy loads, but the world record weight lifted by a forklift was 90 tons and was accomplished in 1989. The record still stands. Forklifts are dangerous pieces of equipment, and it is important to work on and around them in a careful and mindful manner. However, they do not cause as many accidents as you would think. Thanks to new training and certification programs, more and more operators are working safely. And, many facilities that utilize forklifts actually note a decline in workplace back injuries. Forklifts are great tools for your business. They have a long history of moving materials easier and safer than manpower alone. Combine a handy piece of equipment with a properly trained and certified operator and you have the perfect combination for workplace efficiency. Get the most from your forklifts by providing each and every operator with forklift certification training from ForkliftCertification.com! The forklift has come a long way. Probably longer than you think. So what were the direct “ancestors” of the forklift? 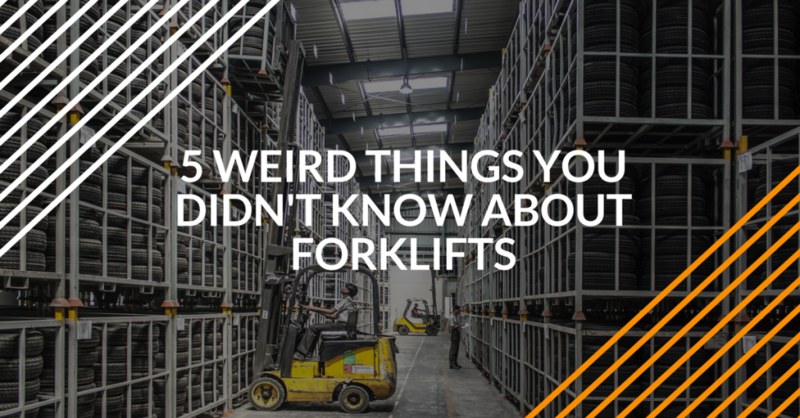 Much like that evolutionary chart we’ve all seen (from monkey to man), the history of the forklift is just as interesting. In this post, we jump in the way-back machine (well, at least as far back as 100 years or so) to find out how the modern forklift and powered industrial truck came to be. Journey back to the turn of the 20th century, when industrialization really took off, and see how the footprint for the forklifts of today were set. Travel through the First World War to see how moving war material (munitions, tanks, and other instruments of warfare) required a “forklift” to manage super-heavy cargo. Many of the most well-known machines of today have their roots in problem-solving. In the forklift’s case, this involved how to maneuver products, store cargo, and ultimately, win a critical war! As our history lesson shows, the story of how the forklift developed through the years isn’t just enlightening – it’ll also give you a newfound appreciation of the machines that drive industry, manage warehouses, handle cargo, and more. As most forklift drivers will tell you, one thing that’s always on their mind is how to avoid accidents. But what about ergonomics? Many forklift drivers suffer from chronic lower back pain, and FLC shows you how to avoid this common ailment with some tips and tricks that you can use today! If you suffer from back pain while operating a forklift, count yourself in the majority. One study showed that at least 9 of every 10 forklift drivers suffer from some type of lower back discomfort. And it’s not just for those grueling 12-hours shifts, either – in many cases, forklift operators working a regular 40-hour week cited lower back pain as a major area of concern. What can you do to ensure your back stays pain-free? Find out here.